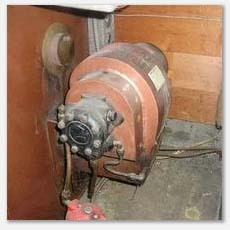 Upon initial inspection of this furnace, it was determined to be over forty five years old. It did not fire from the thermostat and we found that the power was switched off. When it was turned on a noticeable smell of combustion gasses was evident in the home. We shut if off and turned off the breaker at the panel. It had a cracked heat exchanger and the furnace needed to be replaced. If this furnace had been used, it is likely to have released deadly carbon monoxide gas into the home. As furnaces age and get closer to their expected lifespan, having annual checks are highly recommended to keep you and your family safe.